iRelief Pro is the professional advanced version with great effectiveness for pain relief with 4 individual outputs for precise intensity control. The needleless acupuncture is achieved by Pico Technology. iRelief Pro improves body microcirculation, strengthens the immune system; and relieves pain and promotes metabolism effectively. The design of iRelief Pro is based on the advanced and reliable IPC’s proprietary Pico Technology and the application of the Chinese Meridian methodology. iRelief Pro increases Adenosine Triphosphate (ATP) production, enhances body microcirculation and strengthens the immune system, so the body’s innate healing potential will be maximized to optimize body recovery and ultimately promote health. 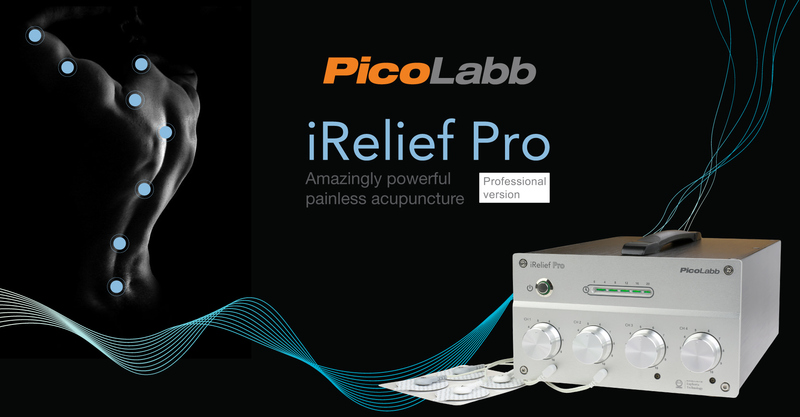 iRelief Pro is equipped with 4 sophisticated individual intensity controls to treat 8 acupoints simultaneously. iReilef Pro is highly recommended to use at clinics or therapy centres. Many people have been benefited by iRelief Pro for pain relief and getting better health. To make the device easy for personal use, we created the iRelief Pads and provide the Wisdom Book for you. For clinics or therapy centres, our training programme will ensure the therapists have proper knowledge and expertise for use of the device. iRelief Pro effectively relieves most symptomatic pain in 10 minutes. For long term pain or chronic diseases, the relief cycle may take more time. The iRelief Pro can relieve various kinds of pain and common illness including: headaches, neck and shoulder pain, back pain, knee pain, arthritis, muscle aches, insomnia, menstrual pain, constipation, indigestion, common cold and flu, cough, diabetes, gout, hypertension, allergies and other chronic conditions. iRelief Pro is remarkable needleless acupuncture device, that combines Traditional Chinese Acupuncture, Chinese QiGong and modern physiotherapy with many years of research and clinical support. iRelief Pro uses an optimized biological waveform that is perfected over the years and is most suitable for our body recovery, the result effectively enhances the microcirculation which helps to improve pain relief, sub-health conditions, immunity disorders, common women's & men's health problems; and for the purposes of beauty and illness prevention. Completely safe to use without side effects. The book helps you for the best use of iRelief Pro to restore health, relieve pain and prevent illness. iRelief Pro is enabled by Pico Technology.